University of Chicago Charter School Woodlawn (UCW) students walked through the doors of a brand new building 1-year ago today. 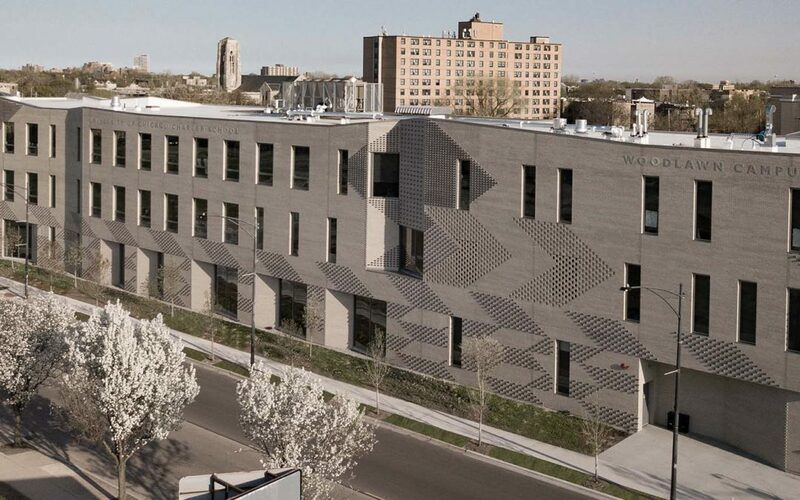 The new building will continue advance the UChicago Charter School’s mission to cultivate culturally aware, critical thinkers and leaders prepared to succeed in college and beyond, and support key goals outlined in the Woodlawn Quality of Life Plan, including the revitalization of the 63rd Street corridor. The new building, located at 6300 S. University Avenue, houses a college resource center, state-of-the-art engineering science labs, a green roof, and a gymnasium designed to double as an auditorium for school assemblies and events. The building architecture was designed to represent Kente cloth, a West African textile, and illuminates different patterns throughout the day. The new facility currently serves approximately 650 6th to 12th grade students from Woodlawn and surrounding South Side neighborhoods and will provide space for community events. The UChicago Charter School’s Woodlawn campus first opened in 2006 and has a strong track record of preparing students for college acceptance and graduation. In 2016, UCW boasted a college persistence rate of 85 percent, ranking second among all non-selective high schools in the Chicago Public Schools district.